"Monstrous men" from an Italian book of iconography. In 1492, when Christopher Columbus crossed the Atlantic Ocean in search of a fast route to East Asia and the southwest Pacific, he landed in a place that was unknown to him. There he found treasures – extraordinary trees, birds and gold. But there was one thing that Columbus expected to find that he didn’t. Upon his return, in his official report, Columbus noted that he had “discovered a great many islands inhabited by people without number.” He praised the natural wonders of the islands. Why, one might ask, had he expected to find monsters? One of the earliest accounts of these non-human beings was written by the Roman natural historian Pliny the Elder in 77 A.D. 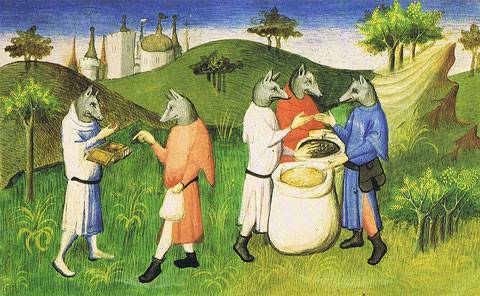 In a massive treatise, he told his readers about dog-headed people, known as cynocephalus, and astoni, creatures with no mouth and no need to eat. 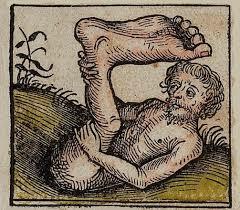 Across medieval Europe, tales of marvelous and inhuman creatures – of cyclops, blemmyes, creatures with heads in their chests, and sciapods, who had a single leg with a giant foot – circulated in manuscripts hand-copied by scribes who often embellished their treatises with illustrations of these fantastic creatures. Though there were always some skeptics, most Europeans believed that distant lands would be populated by these monsters, and stories of monsters traveled far beyond the rarefied libraries of elite readers. For example, churchgoers in Fréjus, an ancient market town in the south of France, could wander into the cloister of the Cathédrale Saint-Léonce and study monsters on the more than 1,200 painted wooden ceiling panels. Some panels portrayed scenes of daily life – local monks, a man riding a pig and contorted acrobats. Many others depicted monstrous hybrids, dog-headed people, blemmyes and other fearsome wretches. Perhaps no one did more to spread news of monsters’ existence than a 14th-century English knight named John Mandeville, who, in his account of his travels to faraway lands, claimed to have seen people with the ears of an elephant, one group of creatures who had flat faces with two holes, and another that had the head of a man and the body of a goat. Scholars debate whether Mandeville could have ventured far enough to see the places that he described, and whether he was even a real person. But his book was copied time and again, and likely translated into every known European language. Leonardo da Vinci had a copy. So did Columbus. Revisiting the arduous path of 18th-century fur trader Alexander Mackenzie. The revelations have prompted personal reckonings and fueled a larger debate about Hispanic and Native American identity. Italian Americans and the commemoration of Columbus.